This house is a great opportunity given what this house has to offer in relation to it’s price! Lots of quirky features and also a lot of original ones. This lovely stone built is full of original character expressed by the exposed stone walls and wooden beams. The house has two bedrooms, one living room and an open space kitchen diner and one bathroom (fully tiled). The bedrooms are both very spacious and have large windows flooding the rooms with light. They also have the exposed wood ceilings and stone walls. The kitchen diner is extremely spacious as here there is the kitchen, dining space and living space all together and with this you still get the spacious feel given by the high ceiling and the exposed timbers. On the main house there is a lovely summer room with lots of windows and there are big doors giving the space a sort of conservatory feel. The house has tiled flooring and central heating throughout. The stone built annex is set over two floors and has three bedrooms, one of them with a built in wardrobe, a fully fitted kitchen, a living room with storage space and three bedrooms. The annex also has central heating. There is an exterior terrace that is only used by the annex. The outside space includes a large swimming pool, a barbecue/patio area and an extremely quirky water well which has been turned into an wine cellar with a spiral stair case that leads down to it. This is such as rare feature and adds to the uniqueness of the property. Parking in the property is not a problem as there is a large space in typical Portuguese cobbles where there is also a car port which at the moment is being used for storage. There is also a barbecue area and a large swimming pool so making the annex into a self contained rental property that could have access to the barbecue and pool area would benefit the rental a lot. The property measures 264 sqm and the land 2870 sqm. 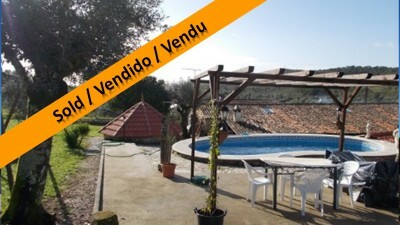 The property is situated in the small village of Chaos which has a small café and mini-market. Every Sunday there is a local farmers market here. The closest town to the property is Tomar, which is approximately 15 minutes by car. Tomar is a bustling market town which boasts a variety of supermarkets, shops, cafes, restaurants, historic monuments, parks, sports centres, hospital, bus and train station and weekly Friday market. Tomar is also home to the UNESCO listed Convento do Cristo, built in the 12th century by the Knights’ Templar. The smaller town of Ferreira do Zêzere is around 20 minutes drive from the property. Ferreira do Zêzere has several supermarkets, restaurants, school, sports centre and bus station. The closest airport to the property is located at Lisbon, which is around one and a half hours’ by car. Lisbon airport is serviced by a variety of low cost airlines, which operate regular flights into and out of the United Kingdom and other European countries.